Pipe Island is the third level of Yoshi's Safari. It is located in the Light Realm of Jewelry Land. As the name implies, Pipe Island is an island covered with Warp Pipes. Smaller green Warp Pipes exist in the foreground as well as throughout the level, and larger, bluish Warp Pipes (including sideways ones) can be faintly seen in the background. This level is full of Koopa Para Troopas and Nipper Plants. It is also home to a Boomerang Brother, who acts as a boss. Wendy O. Koopa in Pipe Island. 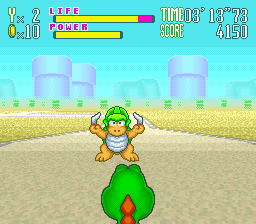 At the end of the level, the player battles Wendy O. Koopa. The Koopaling fights Mario and Yoshi through a row of Warp Pipes, accompanied by a winged anvil that flies back and forth shooting horseshoes. 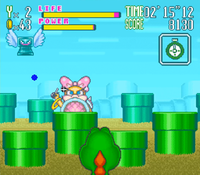 Wendy mainly attacks by throwing bombs at the duo from a random Warp Pipe. The only way to damage her is to shoot the Winged Anvil once it is above her to crash it into the pipe she is attacking from. Wendy is defeated after being hit by the Winged Anvil three times. After defeating Wendy and collecting the third gem, the duo continues on to the next level, Crescent Coast. This page was last edited on November 24, 2018, at 10:56.